Unlikely rock ‘n’ roll photographer Jini Dellaccio visualised punk before it had a name, captured grunge before the hype and embodied indie before it was cool. My journey with Jini began when she was 92. I was passionate that her story would not be lost and forgotten, along with her stunning contribution to the art of photography in the 1950s & 60s. This was a time period when few women were working as professional photographers, let alone in fashion and rock. I leapt at the chance to support efforts already underway to preserve Jini’s archive and vital legacy. During production I was cautioned many, many times funding my documentary would be extremely difficult because Jini was just too unknown and the film would struggle to find an audience. I like to think I drew my strength to ignore this thanks to the ‘magic of Jini’. I gathered a crowd, and ultimately took a lesson from Jini’s own story. She never gave up, and she was always open to learning new things. 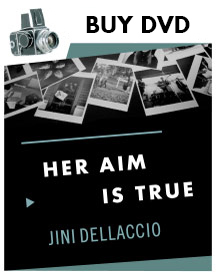 All in all, Jini Dellaccio was not your traditional image of a rock and roll photographer and maybe that has a lot to do with the innovative and beautiful images she was able to create. It is also why her life story is so enduring and relevant today. Jini would always say “YES”, often defying convention and her “age” to take any risk for creativity, and be generous in her artistry. It has been more than 3 years since Kickstarter backers helped HER AIM IS TRUE reach worldwide audiences. Now, an exciting new project is in the works to create a traveling exhibition of images from Dellaccio’s archive. The Harbor History Museum based in Gig Harbor, where Jini shot many of the iconic album covers in her backyard, is carrying on the journey to share Dellaccio’s artistry. Why does this matter? Many women for decades have quietly and anonymously tread indie paths in creativity and business, often taking great leaps forward, risking their all to push the boundaries. Dellaccio did that with her lens, and her body of work deserves to be appreciated by a much wider audience, beautifully framed, up close, in art venues beyond her Washington State backyard. If you agree with me that Dellaccio’s photographic legacy counts up there with the masters we already know about – I hope you will join me in supporting this cool Kickstarter campaign. The ‘magic of Jini’ reminds us of our past and empowers us on our future journeys.